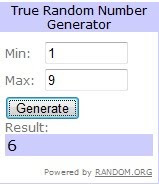 Comment #6 belongs to newmaldon! Congratulations! Send me an email with your address, David, and I'll have the CD sent to you. You'll have to let me know how you like it. If you didn't win and still want to get a copy of Gurrumul's CD, it is available for sale on Amazon and elsewhere! * In case anyone wonders: to keep from confusing myself in the counting, I went ahead and used 9 for the top number, figuring I could reconfigure it if it landed on 3. Which, in fact, it did the first time. Haha.